A Girl's Guilty Pleasures: Memorial Day Sales 2013 -- Huge Savings! Here is a list of huge savings that you can get this Memorial Day! I'll be updating and adding more tonight and tomorrow, so come back for more deals! Pink Basis - 40% OFF Whole Site at PinkBasis.com. Coupon Code: MEMORIAL40. Ends On 05/31/2013. Cici Hot - Memorial Day SALE! 30% OFF Entire Site at CiCiHot.com. Enjoy your savings! 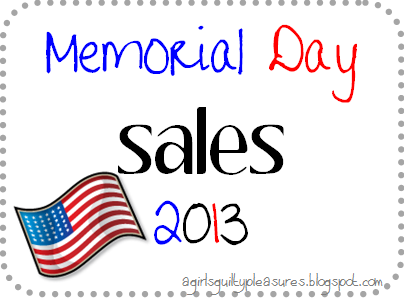 Comment if you know any other Memorial Day 2013 sales! !